Jungle Flyers is an excellent swing ride in Jungala and one of the best attractions at Busch Gardens Tampa. The minimum height to ride is 48 inches. 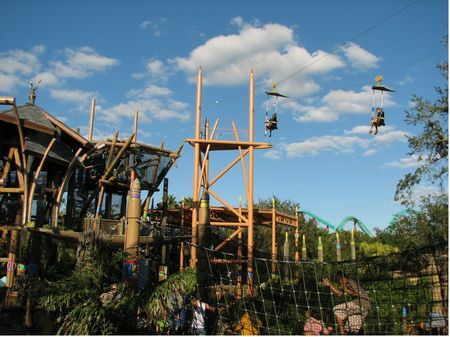 Jungle Flyers is a tree top zip line ride which offers three separate flight paths. Riders will enjoy an out and back ride across the path in a hang glider-like seat. Height requirements state riders must be 48" minimum & 6 yrs. old minimum & 13 yrs. old maximum.